Evanston’s unemployment rate continued to fall in September, decreasing to 5.1 percent from 5.3 percent in the previous month. In 2014, the city’s unemployment rate started at 6.5 percent and has declined 1.4 percent overall since. 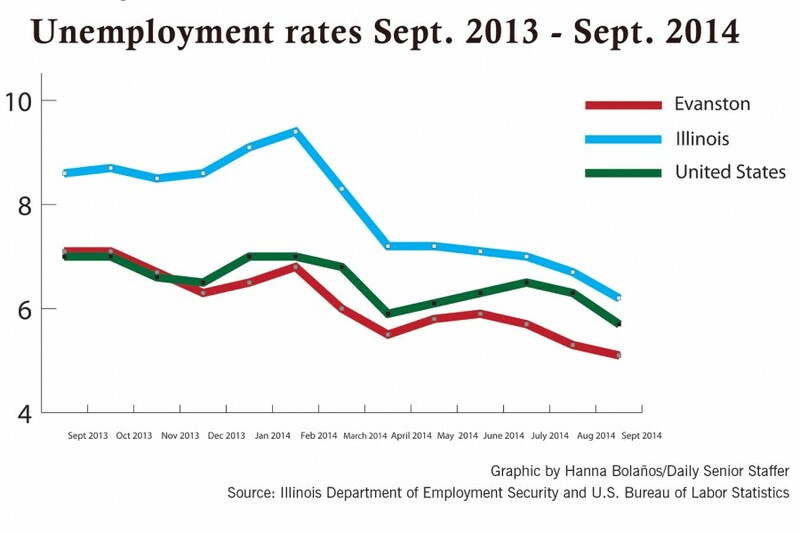 Evanston’s rate is well below that in Illinois and the United States, which were 6.2 and 5.7 percent respectively, before seasonal adjustment, according the the Illinois Department of Employment Security. The lower unemployment rate in Evanston is in part because of the types of jobs Evanston residents have, said Johanna Nyden, the city’s economic development division manager. About 36 percent of employed Evanston residents work in the industry of educational services, and health care and social assistance, according to the U.S. Census Bureau. People who work in these sectors will always be needed, so they are less affected by economic downturn, Nyden said. Nyden also attributed the low unemployment numbers to Evanston’s unique location in having access to a variety of transportation modes, including options for public transit, biking and walking. The U.S. Census Bureau data shows residents’ travel time to work averages about 30 minutes. To encourage the unemployment rate to decrease further, the city is working to develop programs that will ready the younger population, especially 18- to 25-year-olds, for future work, Nyden said. Under Kevin Brown, the city’s Youth and Young Adult program manager, Evanston is working with youth through multiple initiatives and with other community organizations to achieve the most success, Nyden said. “They need to get through job skills so they can move on to their next professional opportunities,” she said. The city is also working to encourage local employers to hire Evanston residents when possible and reach out to residents to promote various job opportunities, Nyden said.